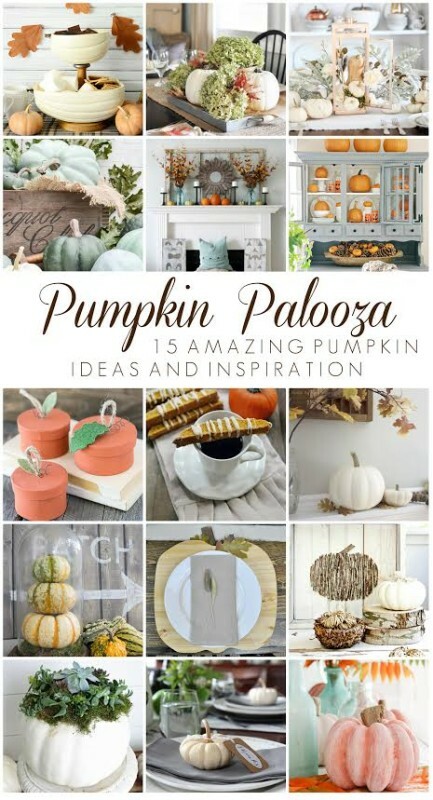 I’m so honored and excited to be teaming up with 14 of my favorite blogging friends and Country Living Magazine today to bring you the first EVER Pumpkin Palooza! If you are stopping by from Craftberry Bush or Bless’er House, welcome! I’m so glad you’re here! 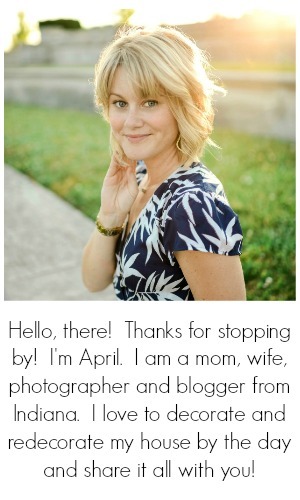 I’m April, and I’m the wife, mommy, teacher, blogger, photographer, and decorating fanatic (whew!) behind this blog. I hope you’ll be back time and time again! After you are done here, be sure to check out the rest of the beautiful pumpkin projects throughout the week! 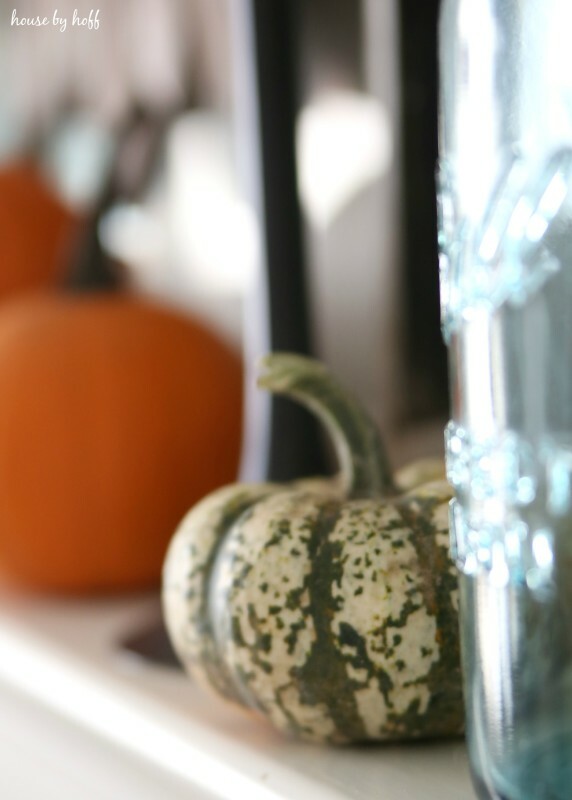 I had so much fun throwing together this pumpkin mantel! It was as easy as adding pumpkins to my existing fall decor, and making a couple of Jack’oLantern signs. …and by “decorate” I mean put them in her doll’s crib, or in her play kitchen’s oven…you just never know where you’ll find a pumpkin hiding. She gets very indignant about her “decorating” too, so I’d better think twice before I even think about moving them back to their original spot. I can’t really be mad though…she honestly wants to be just like me. She loves to “decorate” and I love that she loves to do things like Mama. When I’m done decorating and taking pictures, she even pretends that my tripod is her camera, and “takes pictures” of the house for her “blog”! Beautiful! I love the look of the leaves in the mason jars. EEK! 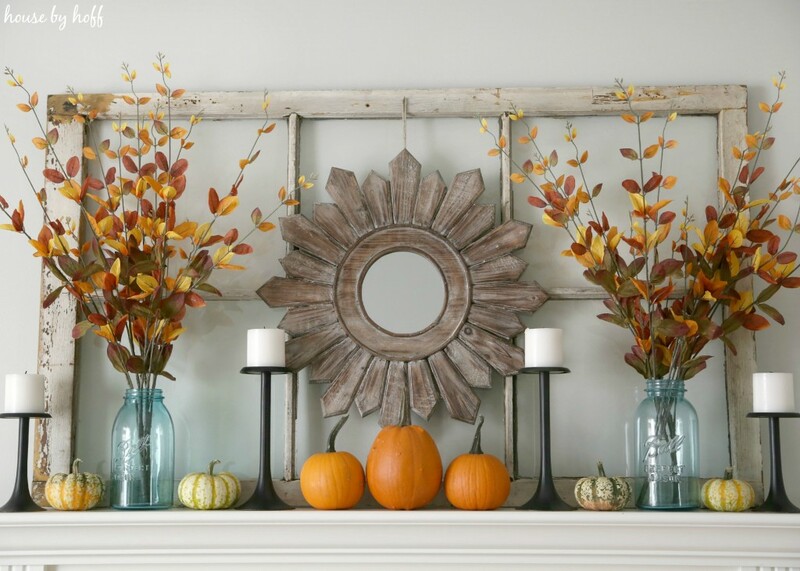 April I love your fall mantel. Love those jack o lantern signs! Can’t wait for the tutorial. I hear ya about the kiddos taking the pumpkins, we have the same little decorators in our home! Thanks for joining us for Pumpkin Palooza! Your mantel looks awesome, April! I can’t wait to see the jack-o-lantern tutorial 🙂 Love that your little one wants to be like her mommy and decorate and take pictures. So cute! Gorgeous!! I love all of your Fall touches! Such a cozy inviting vignette! happy Fall! hey girl- love your pics!! Such cute pumpkins love them! I have quite a few in my house! I still plan on getting a few for outside! YAY fall! So pretty!!! I love all the fall color and that old window makes a perfect backdrop. Those jack-o-lantern signs are adorable too! I absolutely love those leaves!!! Where can they get purchased?! I just had a passive idea for my wedding next year! 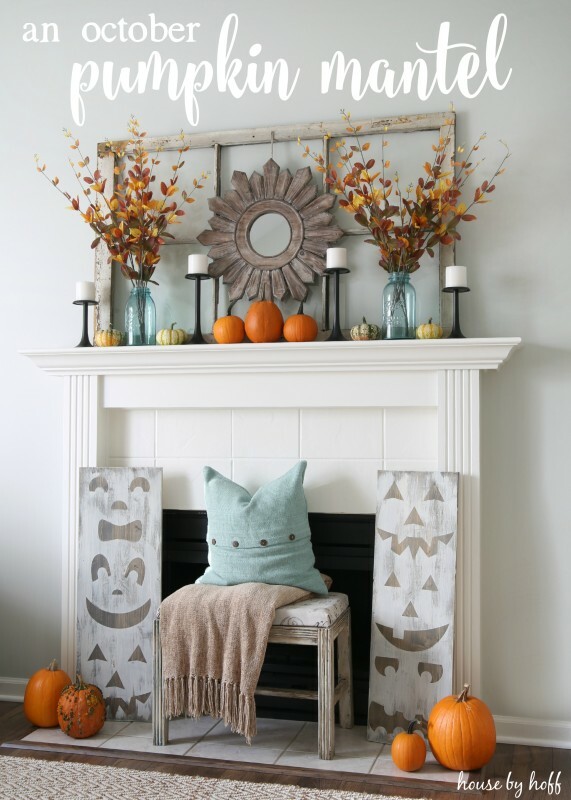 Love the mantel and can’t wait to see the fun jack ‘o lantern project! 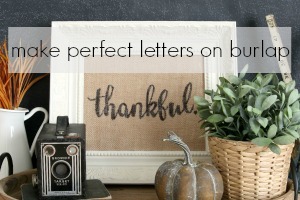 April your mantel is just gorgeous! I love that you were able to use your existing decor and then load in all of that pumpkin goodness. And I had to smile about your daughter because mine did the same thing! They’re just taking after their mamas right? So fun to be apart of this party with you this week! 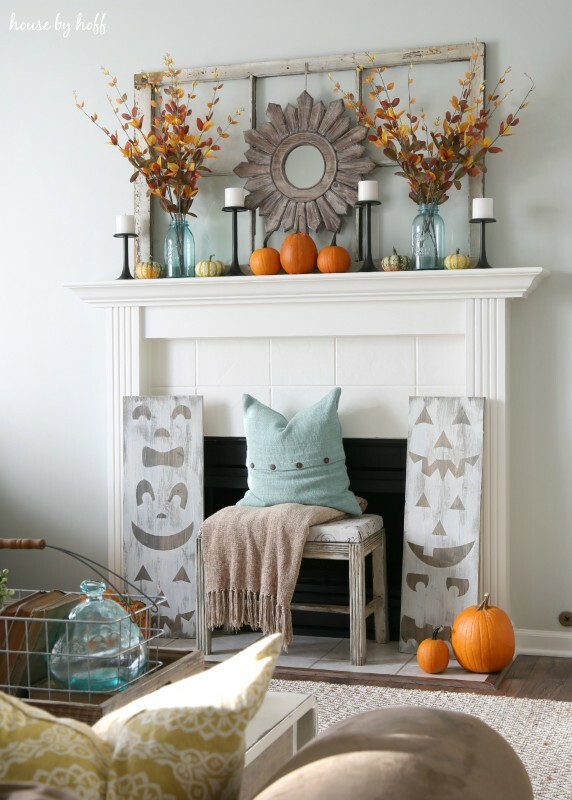 Love your fall mantle! Too cute about your daughter! Oh my goodness, I love those jack o lantern signs so much! can’t wait for the tutorial. Love the rest too, your mantel is always so pretty! Love it, April! I had to giggle at the “pumpkin hiding”. My daughter does the same thing. I have to quickly photograph everything before she undoes it. 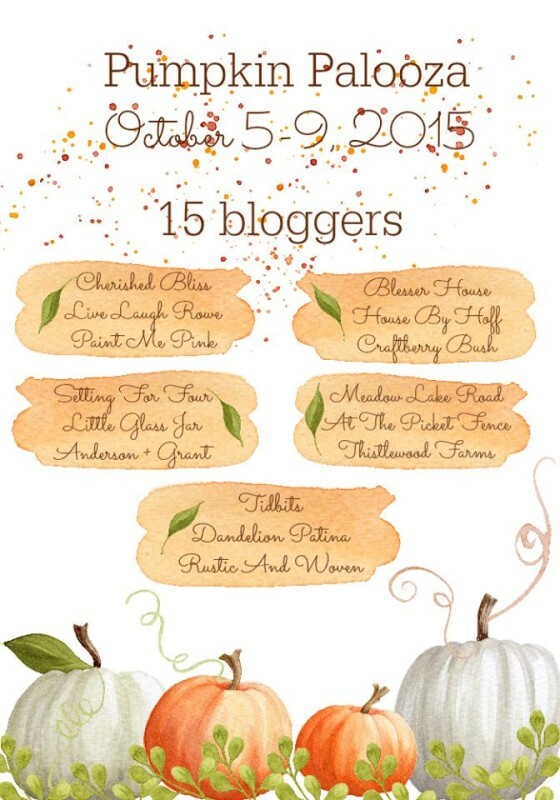 So honored to be a part of this bloghop with you! April, this is just perfect! 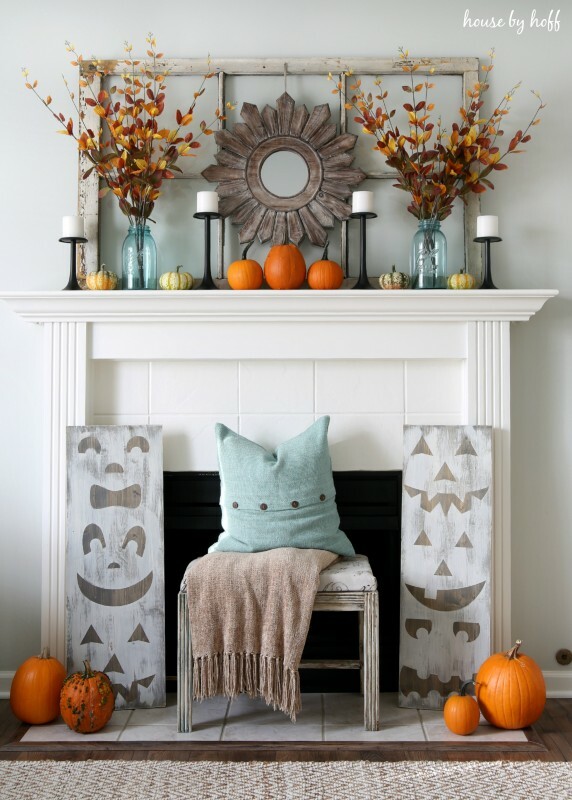 I love how your mantel looks with the little pumpkins, and I am about to go read the tutorial on the jack-o-lantern signs because they are seriously adorable! 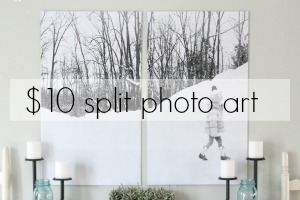 So much fun doing this blog hop with you! You are a talent! XOXO!